Soon after entering the glassy building across from the High Museum on Peachtree Street, visitors pass from the entryway and ticketing desk into an almost otherworldly passageway, compared to the gray concrete streets outside. 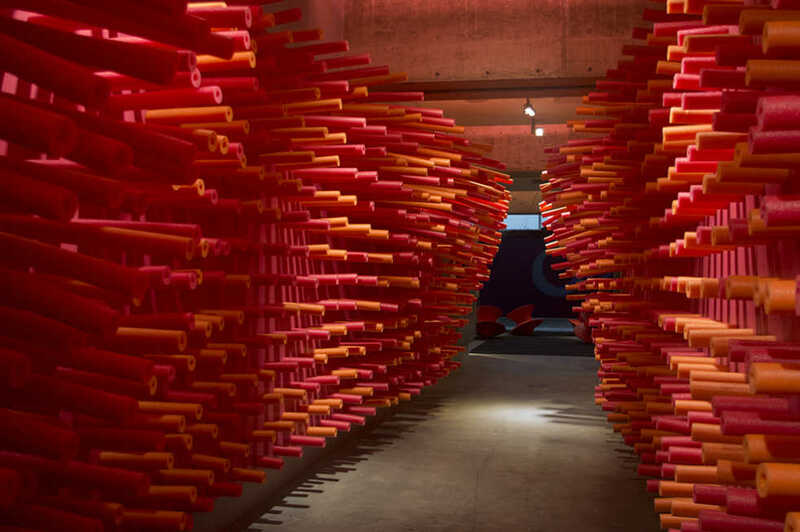 Bright pink and orange pool noodles of various lengths stick out from the walls like tentacles, and as one continues walking, the perspective shift makes the installation seem alive. This piece, a recreation of the work “Delirious Frites” by Les Astronautes in Quebec City, gives a glimpse of how playful cities can be. Despite being partially held together by zipties, the work still does the heavy lifting of getting viewers in the mindset to think about fun urban spaces. Curated by Janelle Miniter with advisement from Cynthia Gentry of Play Atlanta, the exhibit “Designing Playful Cities” explores how opportunities for play and fun can be designed into cities. With the majority of people globally living in cities, established cities are growing without the chance for replanning them. To accommodate incoming and current residents, the basic human need for fun must be addressed. While some visitors may anticipate an exhibit focused on playgrounds and other permanent installations geared towards children, the exhibit includes many temporary or smaller interventions and hacks that help people of all ages have a good time. Like many of its previous exhibits, such as the graphic design and typography focused “Text Me,” MODA’s latest installment features interactive elements. After passing through the “Delirious” pool noodles, visitors find 12 spinning chairs in the center of the back gallery. Featured across the world in plazas and other public spaces, these chairs were developed by Thomas Heatherwick. Spinning on one of these chairs is an act of trust that is oddly freeing and relaxing. One can imagine that stepping out of the office and taking a chair for a spin would be an easy way to add more fun into an urban workday. On the walls surrounding the chairs are case studies of urban designers, architects and landscape architects who have leveraged opportunities to makes often unexpected spaces playful. From a housing development in Japan designed by all women architects on the site of rice paddies to a playground along a river in England, the incorporation of the natural setting can be delightful. “Design is a process: when it’s done best, the users tell the designers what they need, instead of designers sitting around and thinking that they have figured out what somebody wants. So it’s only appropriate in designing a playground that you would turn to the children who might use it,” said MODA Executive Director Laura Flusche. A Parisian playground was planned after surveying kids and resulted in a much more physical, daring playground than the typical flat, fenced off, padded American playground. “One of the reasons that a lot of projects you see in this exhibition come from Europe or Asia is that liability laws are very different there, and the habit of suing people that we have in the United States is much less rampant,” Flusche explained. One project proposed by Fletcher Studio for Atlanta’s Woodruff Park in a 2010 design competition was an adventure playground, which featured leftover parts from urban infrastructure and a creative area that let kids make things with interesting building materials. The winning project was the climbable “ATL” letters that are still in the park today. “At MODA we tend to look forward with our exhibitions instead of backwards… We really want there to be impact and people to find new ways to think about the city after they see it,” Flusche explained. This exhibit will surely inspire and entertain viewers. While not as dense and varied thematically as the previous exhibit, “Designing Playful Cities” still deftly engages both casual and expert audiences with a timely subject important for the wellbeing of cities and citizens.